Can you count to 145 on your tingling, frost-numbed fingers? Because that’s how many days we have until Bike Camp begins! As the season stretches toward spring and summer, we’ll be trading out rain pants for Ray-Bans (or perhaps a more affordable option), winter wear for water bottles, fenders for front-wheel racks, long sleeves and layers for T-shirts and sunscreen. And what better way for kids to make the most of their summer than with new friends at Bike Camp. Each summer, kids flock to our shop with their bikes, imaginations, and goals to expand their geographic and personal horizons. Bike Camp teaches safety, group riding technique, right of way, and basic, hands-on maintenance skills. Yet the biggest lesson is the empowerment kids receive from a summer adventure on two wheels. This summer we are bringing you new camps, expanded camp offerings, and—back by popular demand—returning camps that are really awesome. 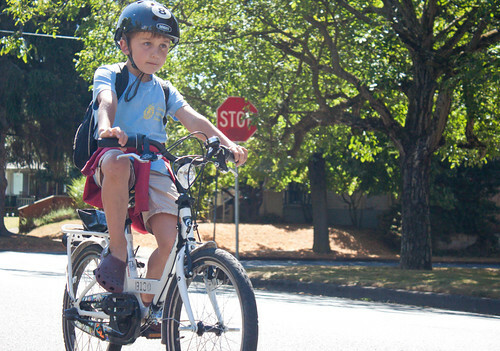 There’s hardly anything cuter than a first grader on a bike. Now, imagine 12 of them! If the cuteness level is not verging on painful, stop reading this blog post and consult with a medical professional. For our youngest riders, every time on the bike is an adventure. We want to give our youngest campers the space to work on bike skills while in an environment that can accommodate the silly playfulness that is special to this age. Or, in education-speak, we want to provide a program that is developmentally appropriate for children at this age and skill level. That’s why we’re excited to be implementing a new age group for our youngest campers. Pedalers camp will be a safe setting for early riders to develop their basic riding skills. To participate in the camp, riders must be able to start and stop unassisted and ride in a straight line. This camp will be a great chance for children to improve their comfort and confidence in basic skills like power-starting, braking quickly, balancing, cornering, and safely crossing controlled intersections. Riders will practice these skills both in controlled course environments and out on the road. Campers will come out of this camp with better control over their bike and with a basic understanding of the rules of the road. Because the only thing cuter than 12 first graders riding bikes, is 12 safe, enthusiastic, and skilled first graders on bikes. 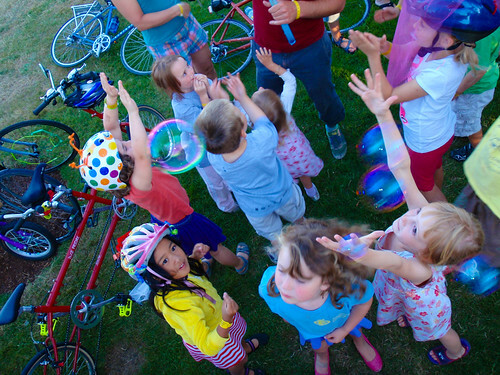 Last year we saw the launch of our first offsite camps at a new hub, Sellwood Cycle Repair. These camps gave returners the chance to try Bike Camp in a whole new part of the city and made our camps more accessible to families in SE and SW Portland. Camper’s cruised on the East Bank Esplanade, ventured downtown, climbed Mt. Tabor and Powell Butte, and gardened at Zenger Farm, all while exploring the neighborhoods of South East Portland. 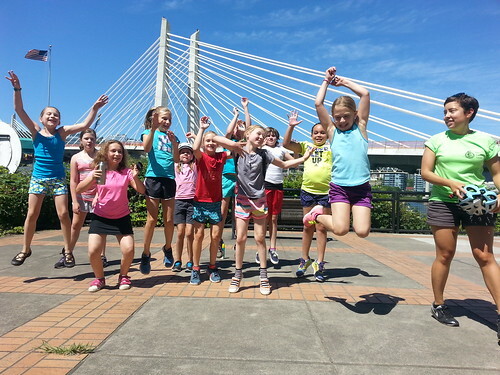 Due to the popularity of these camps, this year we are expanding our offerings out of Sellwood Cycle Repair from 7 camp sessions to 12 sessions. Offerings include new Pedalers group and additional camps for the Cruisers, Advanced Cruisers, and Freewheelers age groups. We’re excited to grow our camps to meet the needs in SE! Themed Camps are back! Last year we piloted two new themed camps: Crafty Cruisers and Spanish Immersion. The Crafty Cruisers explored the possibilities of incorporating bike parts into creative art projects. With projects from bike tear-downs, to creating cog-stencils, to customized tool creation, we can’t wait to see what the Crafty Cruisers come up with next! And the Spanish Immersion Camps were a fun setting for campers to develop their cycling and language skills simultaneously. Middle Schoolers can still explore Portland’s food culture with Foodcart Freewheelers. 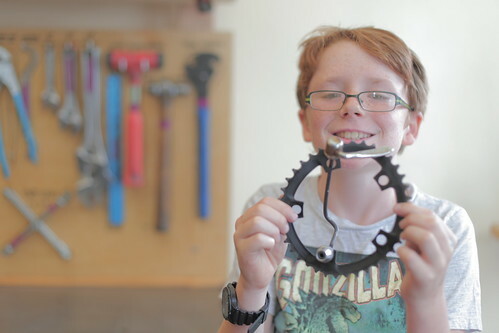 They can also try their hands out wrenching on bikes and meeting local bike builders in our Mechanics Camp. We hope to see you this summer! Bike Camp registration begins on February 2nd. Check out our full Bike Camp summer schedule here. See you in 145 days!